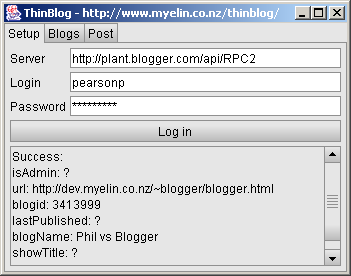 ThinBlog is a very small Blogger client. It lets you post to a Blogger weblog from your desktop. It's written in Java, and uses Thinlet for its GUI. And of course, XML-RPC for transport. Save the file to your hard disk and double-click on it. You'll need to have the JRE (5 MB) installed. It might not work for you! If it doesn't, drop me a line and I'll do my best to make it work! (See the 'feedback' link at the bottom of this page). The ThinBlog code is free (MIT license). Look inside the JAR file (it's ThinBlog.java). Thinlet is licensed under the Lesser General Public License: here is its source code.